Are Trump Regime Hardliners Sabotaging US -North Korea Talks? Washington can never be trusted. Its promises are consistently broken. Accepting US pledges at face value is hazardous. Washington has been in a state of undeclared war on the DPRK since adoption of the uneasy 1953 armistice. What’s going on post-mid-June Kim Jong-Un/Trump summit talks is reminiscent of how US/DPRK relations unravelled earlier. In 1994, US/North Korean talks were held. An Agreed Framework was signed. Pyongyang agreed to replace its nuclear power plant program with a light water nuclear reactor, along with steps toward normalizing relations with Washington. The Clinton regime agreed to build two light-water reactors by 2003. It promised to supply Pyongyang with 500,000 tons of heavy fuel annually. US sanctions would be lifted. The DPRK would no longer be designated a state sponsor of terrorism. Both countries agreed to provide “formal assurances” against threatened or actual use of nuclear weapons. Pyongyang agreed to allow Washington to monitor its nuclear sites. The deal collapsed after GW Bush called North Korea part of an axis of evil in his first State of the Union address. The DPRK upheld its part of the deal. Washington systematically breached it, reneging on its word. North Korea responded by resuming plutonium enrichment. In August 2003, six-party talks were initiated, involving North and South Korea, China, Russia, America and Japan. In 2005, Pyongyang pledged to abandon “all nuclear weapons and existing nuclear programs.” In 2009, talks broke down following disagreements over verification, along with international condemnation of a DPRK ballistic missile test – what many other countries do without criticism of their programs. Hostility and betrayal defined US policy toward North Korea throughout its post-WW II history. Washington breached earlier agreements, not Pyongyang – eager for rapprochement and normalized relations, what the US consistently rejected. Is this time different with the most extremist/belligerent ever US regime in power? Since Kim/Trump summit talks in mid-June, US relations toward North Korea deteriorated. Trump regime hardliners demand everything in return for empty promises. Russia is furious about a leaked confidential UN report on the DPRK – prior to discussion by the UN Security Council Sanctions Committee members on North Korea, a gross violation of Committee rules and standards. World body leadership was likely complicit with Trump regime hardliners, opposed to improved relations with Pyongyang. An early August leaked UN report claimed DPRK nuclear and missile programs are still active. It also accused its government of breaching sanctions that never should have been imposed in the first place. Washington may resume provocative regional military exercises North Korean officials believe are rehearsals for invasion. Cancellation of Pompeo’s visit to Pyongyang days earlier for a fourth round of talks on DPRK denuclearization apparently was over Deputy Workers’ Party of Korea Kim Yong Chol’s letter, expressing understandable concern over the Trump regime’s unwillingness to sign a peace treaty – ending Harry Truman’s war. Kim suggested one-sided US demands may undermine talks. An unnamed senior Trump official said Bolton and likely Pompeo favor toughness in dealing with Pyongyang. They support stiffer sanctions, including a full oil and gas embargo, certain to undermine negotiations like earlier if things move in this direction. Washington doesn’t negotiate in good faith. 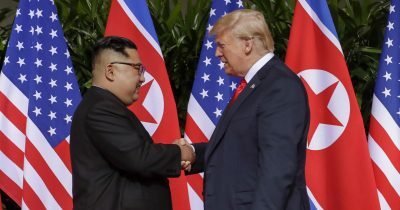 Sputnik News quoted an unnamed policy analyst, saying “in almost all of the give-and-take” between officials of both countries, “the ‘give’ has come from North Korea” – the take demanded by the Trump regime.